This was my first ever recommendation to a graphic novel. Had it been about vampires or medieval Spain I might have balked. But Jerusalem is….well, it’s Jerusalem. As you’ll know if you’ve been there, there’s no spot on earth quite like it. I was interested in seeing what a cartoonist would do with the place, that hasn’t already been done by Jews, Arabs, Crusaders, religious zealots, Zionists, Muslims, Christians and the million other types of people who seem to have a deadly interest in these few acres of the not-so-holy Holy Land. Besides, where else does a best-seller feature a Lutheran pastor, even in a small cameo appearance? I got the novel at the library, and started reading. And C was absolutely right: I did find the novel relevant. And entertaining. AND more than a little heart-wrenching. And because, with the Waterloo Lutheran Seminary group I visited the Lutheran chapel and hospital at Augusta Victoria in East Jerusalem, right above the Mount of Olives, I wanted to see it again, through an outsider’s eyes. It turns out that, unlike the omnipresent dividing Wall (which features again and again in the book), Augusta Victoria became a place of rest and reflection for the author (Delisle became friends with the Lutheran pastor, who is a comics fan, and had his studio there). I’m not a follower of comics and despite his success, I didn’t know Delisle’s work. He’s a Quebecois who has lived many years in France. This book (originally published in French, English translation by Helge Dascher, published in 2012 by Quill & Quire of Montreal) is the result of his family’s one-year stay in Jerusalem. During that year Delisle took care of the kids and sketched while his wife worked for Medecins sans Frontières in the West Bank and the Gaza Strip. Get this novel and read it. It’s worth it. 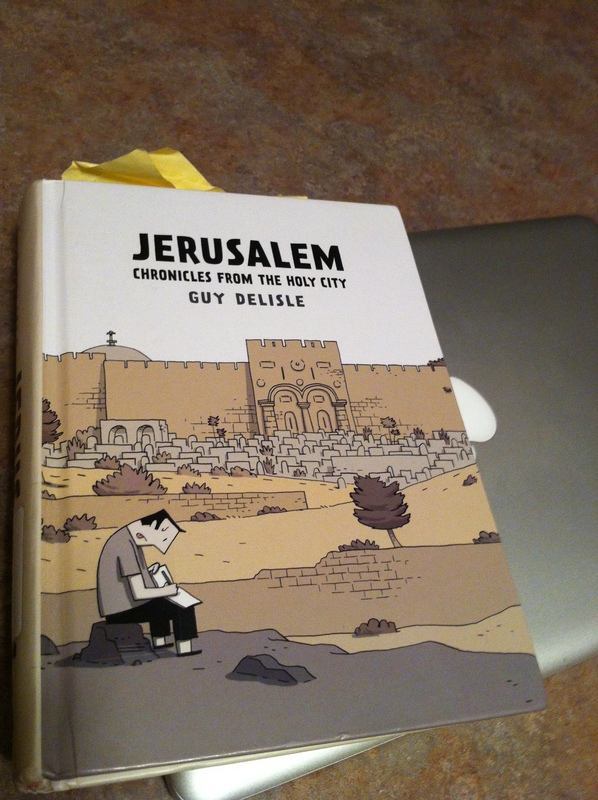 Firstly, Delisle is honest but hilariously understated in his portrayals of life in the so-called Holy Land. There’s no shouted polemic. Instead Delisle’s slightly dopey, typically nice Quebec/Canadian alter-ego meanders through, and chronicles, the absurdities that seemingly pop up everyday in and around Jerusalem: an Israeli soldier with a massive machine gun slung in front of him and an equally large guitar slung over his bag, Palestinian women shopping in the settlement grocery store the expatriate workers from overseas, in solidarity with Palestine, have been so studiously trying to avoid, Christian priests coming to blows over which part of the Church of the Holy Sepulchre is theirs, Palestinian children afraid to go to school in the West Bank because of the settlers and Israeli taxi drivers afraid to go into East Jerusalem because of the Palestinians. One of Delisle’s funniest lines is “thanks God for making me an atheist”. The most touching, and yet still understated, part of the book is at its end, as the family prepare to leave after their year-long stint. But I won’t spoil the ending for you. Read it yourself. Jerusalem: Chronicles from the Holy City is the kind of book that, like a seemingly harmless “nice guy”, sometimes surprises you. Delisle’s everyman is a sharp-eyed observer, and this novel has a punchline, even if you have to look for it. Over a quarter-century ago, before they came back into fashion, my father was throwing out some of his clothes. One of the items was a Siwash sweater he’d worn in the late 1950s and early 1960s. If you’re unfamiliar with the term Siwash, they are also called “Cowichan” sweaters, after a style developed by the indigenous peoples of south-east Vancouver island (see Wikipedia: http://en.wikipedia.org/wiki/Cowichan_knitting). Truth be told, back then I wasn’t sure what I thought about the sweater. I’d only ever seen “old people” wear them – and most of those old folks were curlers at that. But the sweater was hand-made, and hand-made for my father with images of his 1950s construction vehicles on it, which to me made all the difference. So I saved the piece, and had it resized for my smaller frame by a kind elderly neighbour. Then I put it in a box for almost thirty years, only taking it out occasionally. This last week I put the sweater on. My father has been wheelchair-bound for a long time. He’s lost weight – a lot of weight, and the sweater that I had made smaller would now be much too big for him in turn. I wear it, not in Saskatchewan where it came from, but in Montreal, where, for at least the moment, and for certain groups of students such sweaters are all the rage (not being the pinnacle of style, I may have missed ‘the moment’ even as I report it!). But this was more an act of memory and legacy. When I put on the Cowichan this last week, I felt connected across the decades to the man my father was. Don’t ask me exactly how this works. But to feel the wool across my shoulders makes me realize how he and I are connected. We are very different men, in very different times and places. But as he passes 80, and suffers so badly from crippling Parkinson’s, I wear the sweater and wonder: “what was he thinking when he wore this?” “How did he look at the world?” “Did he have any idea what lay ahead?” He would have been a younger man than I am now. But the wearing connects me to him, and to that wild, open country from which both he and I come. We can talk all we want about memory being a mental process, but in families as in religion there’s something important about the totem, the symbol, the revered object. There’s something special in taking an object into our hands and letting the memories enter us through our skin. This last week my daughter, who has been eying one of my own sweaters, came out of her room one morning before school. “I’ve got nothing to wear,” said the young woman who has drawer after drawer of clothing spilling over. “Could I wear that sweater of yours?” She had a sparkle in her eye. It’s all about connection. I just might ask my grown sons if they have anything I can borrow.